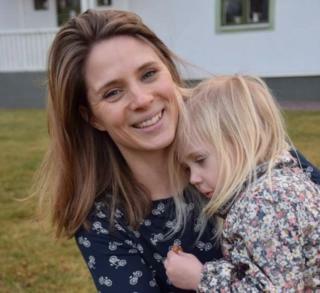 A Swedish mother's successful stand against sugar has turned her into a social media sensation. Anna Larsson decided to cut out sweet treats after realising how bad her young daughter's cravings had become. The results shocked her: after a difficult few days, the little girl was no longer asking for yoghurts and iced buns, but happily consumed healthy options she would once have rejected. What's more, she was sleeping better and was less grumpy. Amazed, Mrs Larsson, 38, took to Facebook to share her experience in a post which has since been "liked" more than 2,400 times. "I was in shock at the response," Mrs Larsson told the BBC. "I really don't know why it happened. We know it is bad to give a lot of sugar to kids, or to anyone, so it is not news. "I think I got this result with my story because I am just a normal person, and not a doctor or nutritionist." Mrs Larsson decided to start cutting sugar out after her four-year-old daughter, who she is choosing not to name publicly, had a tantrum when she refused sweets. "She said, 'It seems like I am never going to have it again'," Mrs Larsson, a former journalist who works in physiotherapy, recalled. "I thought, she has real cravings for sugar. She did not want to eat the food we are making, all she wants to eat are things like sweet yoghurts." Within days of making the decision to cut down on sugary treats, the difference was clear. "She was calming down so quickly, falling asleep so quickly in the evenings - and she did not want to look at the television all the time, she wanted to do things." However, while it is widely believed that sugar can affect behaviour, there is little scientific evidence to back this up. Food which had been rejected by Mrs Larsson's daughter a week ago was now being described as the "best ever". "Her taste buds were like new," said Mrs Larsson, who was so surprised by the results she decided to share them online. It seems to have struck a chord with hundreds of other parents. Since then, she has written articles for national newspaper Aftonbladet, and has appeared on television. But not everyone has been so impressed. "Some people think it is extreme, but I have never said you cannot eat sugar. We do eat sugar - but you cannot eat it every day." Mrs Larsson is now calling on other parents who are concerned to follow in her footsteps. "If your kid has this total craving for sugar then they need help. The kid cannot do it themselves - it is up to us parents," she said. Do Swedish children have a problem with sugar? While sugar does not directly cause type 2 diabetes, people who are overweight are more likely to develop the condition. Sweden has one of the lower rates of diabetes and overweight children in Europe. In 2015, the International Diabetes Federation reported a 4.69% prevalence of diabetes, both type 1 and 2, in the country, slightly lower than neighbouring Norway and far lower than Europe's worst offender, Turkey, which has a 14.85% prevalence. Meanwhile, a report by the World Health Organisation (WHO) put the number of overweight seven-year-olds in Sweden during 2007/8 at 23.5% for boys and 22% for girls, with 6.8% and 5.1%, respectively, being obese. In comparison, Ireland - which has one of the highest rates of childhood obesity in Europe, reported 31.8% of boys and 27.3% of girls were overweight at the same age. However, experts are still calling for more to be put into education and health campaigns in Sweden. Update 27 March 2017: This report, originally published on 1 March, has been updated to make clear International Diabetes Federation figures are for both type 1 and type 2 diabetes.